four boys and four girls! Photos of puppies will be available soon in the Gallery. Ther pups will be ready for new homes the 18th October. hips B/B, elbows 0/0, accepted character test +172 p.
We are waiting for the pups to be born in the end of August, in weeks 34 - 35! You can see their pedigree here. 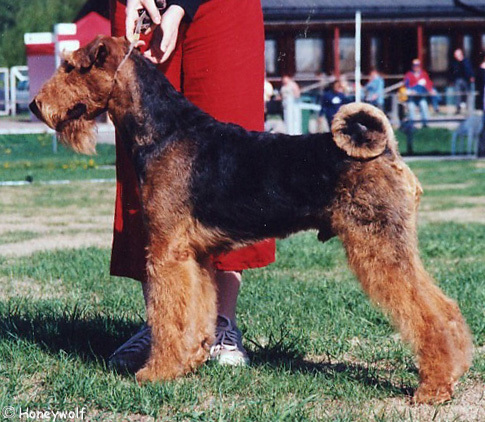 I’m doing my best in choosing the breeding combinations so, that the puppies could grow up to be as healthy, mentally balanced and beautiful Airedale terriers as possible. 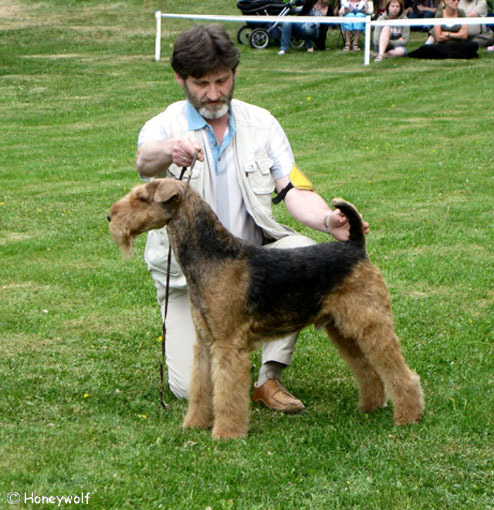 My aims are: a rewarding everyday life with the beloved Airedale friend, health, mental balance, enchanting personality, good conformation, correct coat. 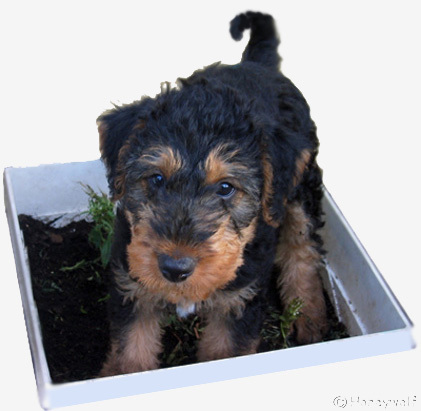 I’m very pleased when a Honeywolf dog will distinguish himself in training and field trials, but most important for me is the real decent Airedale – with the correct breed typical spices!. The puppies are growing practically taken in the back of our living room, and they will get accustomed to the normal everyday life. They are eating mainly carefully composed fresh food, but also the dry kibbles will be introduced. At the age of eight weeks the pups have been wormed, microchipped, mentally tested, and inspected by a veterinarian. The new owner will get printed care and feeding instructions with the pup. I will strip the pup for free at 4-5 months of age, and I’ll always be available and help in the phone when needed. Abby’s first litter was born on the 30th June 2007. All pups found an own good home, most of them even near to the breeder! The darling babies have now grown to be fine young Airedales, who hopefully are bringing much joy to their humans. Many many thanks to my puppies’ wondeful families!